Mid-to late 1920s Most of the major Hollywood motion-picture studios had been established by this time, including the Big Five (Warner Brothers, Fox (later 20th Century Fox), RKO, Loew's Inc. (Metro-Goldwyn-Mayer (MGM)), Paramount (from Famous Players-Lasky)), and the Little Three (United Artists, Universal, and Columbia). All of these studios used Thomas H. Ince's efficient and profitable filmmaking "factory system." 1925 The great Russian filmmaker Sergei Eisenstein directed Battleship Potemkin, a film celebrating the 20th anniversary of an unsuccessful Russian Revolution in 1905 and a portrait of mutiny aboard a battleship named Potemkin. His influential film, considered one of the greatest of all time, premiered at Moscow's Bolshoi Theatre. The landmark film effectively established the dialectic film montage technique, especially in the Odessa Steps sequence (copied later - in tribute - in films such as Brazil (1985), The Untouchables (1987), and comically in Naked Gun 33 1/3: The Final Insult (1994)), as an important and innovative structural method to evoke a dramatic response from the juxtaposition of two clashing film shots. Non-linear editing in future films, such as Pulp Fiction (1994) owe their stylistic techniques to this film. 1925 The epic silent film Ben-Hur: A Tale of the Christ (1925) was released - it cost a record-setting $3.95 million to produce, but the blockbuster for MGM grossed $9 million on its first release. It was notable for its use of a hanging miniature - to fill in the upper tier portion of the coliseum (with fake spectators) for the famed chariot race sequence. It also contained some two-color Technicolor sequences (e.g., the triumphant processional sequence). 1925 The silent film The Salvation Hunters (1925), the first film made by unknown director Josef von Sternberg, has been called the first American independent film. The low-budget film was bankrolled by UA after its major shareholders (Charlie Chaplin, Mary Pickford, and Douglas Fairbanks, Sr.) saw the film and were impressed by the talents of the director. 1925 One of silent film genius Charlie Chaplin's classic masterpieces featuring the Tramp character was released -- The Gold Rush (1925). Chaplin directed, produced, starred in, and scripted the film. It became the highest grossing silent comedy film of all time. 1925 Charlie Chaplin was the first film actor to ever appear on the cover of Time, the Weekly News Magazine - the July 6th, 1925 issue, in a picture from his recently-released film The Gold Rush (1925). He made a second appearance on the cover of the February 9th, 1931 issue. 1925 Universal foreshadowed their success in the horror genre with Rupert Julian's expressionistic The Phantom of the Opera (1925), starring Lon Chaney, Sr. ("The Man of a Thousand Faces") in his most notable role as the partially-disfigured "Phantom" in the Paris Opera House. It set the prototypical style for the studio's cycle of classic horror films in the early 30s - the decade of Universal's monster movies (Dracula, Frankenstein, the Mummy, etc). 1925 The first feature-length dinosaur-oriented science-fiction film to be released was First National's The Lost World (1925). It was also the first feature length film made in the US with the pioneering first major use (primitive) of stop-motion animation with models for its special effects. 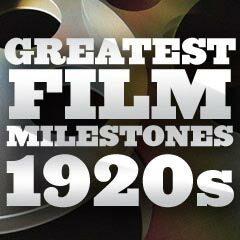 1925 Western Electric and Warner Bros. agreed to develop a system to make movies with sound. 1925 Fritz Lang's UFA production of Die Nibelungen: Siegfried (1924) (adapted from the Norse sagas) premiered in the US in New York City in 1925, introducing the short-lived synchronized, Phonofilm sound-on-film process. 1925 The fan magazine Movie Weekly held a contest to provide a new name for MGM contract starlet Lucille LeSueur. MGM's publicity department had complained that her name sounded fake and like the word "sewer." The winning name was Joan Arden, but since it duplicated another actress' name, it was soon changed to Joan Crawford. In this year, Crawford starred in her first film, the dramatic comedy Pretty Ladies (1925) - credited by her birth name of Lucille LeSueur. 1925 A title card in the silent epic war film The Big Parade demonstrated one of the earliest uses of a curse word in a US film, although it wasn't spoken: "March and sweat the whole damned day..."